I wrote this practical, easy guide for those, like myself, who need to access and unblock sites from abroad, that have geographical restrictions. 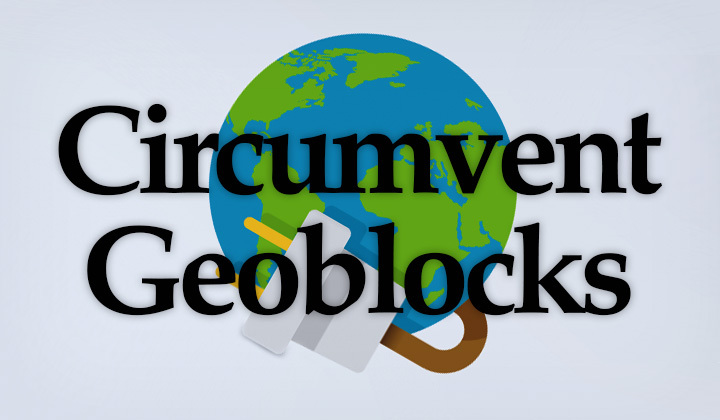 Here’s some clarification to the multitudes of geo-block circumvention. Basically there are two, quite different cases of use with different solutions. Circumventing geo restrictions of (1) live TV channels, and other video streaming sites (2) other services, and sites like Facebook, Youtube, Google, etc. Here’s a brief explanation of both with recommendations below! The most common reason for sites to block visitors by their geolocation, is that they provide streaming of movies, tv programs and other licensed video or music material, which is restricted to a specific country according to their license. Such as Netflix, Hulu, BBC, Amazon Prime, etc. For this, the most reliable and affordable method, is to use so called “Smart DNS” providers, which simply put, unblock these kinds of sites from wherever you are without slowing down your connection. Neat! There are other types of sites, and services that you can also get geolocked from, when traveling in a foreign country for example. Usually, they simply require your internet connection to be located in a specific country location. For this, the best way is to use a “VPN” provider (meaning Virtual Private Network), which can route your internet traffic through the country of your choice. Therefore, it will make it look like you are located in that country, even if you are not. This method is also the easiest to set up, and some VPNs also work with TV channels and video streaming sites (most VPNs have poor support). I recommend ExpressVPN, considering the needs to circumvent geo restrictions. But if you are willing to get through the learning curve, and use circumvention for streaming, I encourage having a go at Smart DNS services. While I highly recommend SmartyDNS as it is the easiest to use, which is the best one for your purpose depends on what channels you want to unlock. Each Smart DNS provider has a different list of supported channels, and you need to go through each one to confirm compatibility. If you cannot find what you are looking for, the option you are always left with is using a VPN connection. Don’t get geolocked or geoblocked! Happy live TV streaming and unlocking geo restrictions! National Geographic Channel, Oprah, Sveriges Radio, Pandora, TV10 Play, Animal Planet, BBC iPlayer, FandangoNOW, Livestream, Amazon Prime, TVNOW, SiriusXM, iHeart Radio, Epix HD, Comedy Network, Digiturk Play, TV6, HBO GO, DittoTV, Disney Life, TBS, AFL AU, Canal Play, MTV, SwagBucks, Shudder, Ondemand Korea, ABC iView, NCAA, MediaSet, 4Music, Masters, Global TV, ZDF TiVi, PGA, Viaplay DK, rTVe, ESPN UK, AOL On, SportsNet, NFL Game Pass, CWTV, Lifetime, V8 Super Cars, CBC, PLUTO TV, FoodNetwork, NFL Now, D-Smart Blu, ABC, Simpsons World, RSI, TV4 Play, MySqueezeBox, Professional Darts Corporation, A&E TV, HGTV, Animal Planet GO, Rdio, LightBox, VH1, 3sat, Tennis Channel, BluTV, VOOT, Cricket Gateway, Sports Canada TV, Golf Channel, BBC Sport, Stofa, FOX SPORTS GO, France TV 1,2,3,4,5 & Pluzz, Blinkbox, Nickelodeon, NBA, 3DGO, Videoload, DMAX, BeIN Sports AU, ESPN, OSN, Stan AU, TV4 Play, Crackle, NFL GameRewind, Dplay, Eurosport ES, UFC, The Daily Show, Smithsonian Channel, Crunchyroll, FOX News, NBC Sports Live Extra, SyFy HD, USA NOW AppleTV, Comedy Central, TV Catchup, Zuus, WWE Network, AMC, Hulu, Aftonbladet, MSNBC, History, Eonline, DR, National Lottery, Blockbuster On Demand, Amazon Prime Germany, ZeeTV, 4oD, TV8 Play, FX Networks NOW, 6play, SkyGO NZ, CNBC, ESPN GO US, 6Play, MLS Soccer, TV Spielfilm, Yomvi Plus, TV2, Star Sports, MBC, RTR, DIY Network, PBS Kids, FOXTEL, Fox Sports, Sky Go, FOX Soccer2GO, Alarabiya, Mubi, MGO, BYUtv, Premier League Pass, Canal Digital, cwseed, NHL GameCenter, ServusTV, Cinema Now, MyCanal, BeIN Sports Connect, Ard Mediathek, HBO NOW, Sundance Now, FX Networks, TF1, TV3 Ireland, TLC GO, South Park Studios, Funimation, Tata Sky, Big Bash, TV3 SPORT, SBS, beIN CONNECT ES, Netflix, Zattoo, Now TV, Sling, Viaplay SE, SRF, TVPlayer, Shomi, Total Channel, Drama Fever, TNT Drama, Cooking Channel, Zee Family, Disney XD, Mitele, CNN GO, Travel Channel, iBox Live, PBS, History Canada, Swiss INFO, AbsoluteRadio, Fox, Logo TV, beIN Sports Connect, Itv, ProSieben, MagineTV, EuroSports Player UK, RTLnow, Tvyo, HGTV, Viaplay NO, Maxdome, RTS, Canal Plus, HBO Nordic, TV3 Play, Ulive, Fandor, Planet Rock, Tastemade, Science Channel GO, SHOWCASE Canada, Last.fm, SimpleStream, 9Now, Bravo, DPlay Kanal 5, SVT Play, Turntable, Sprout Now, Yahoo Screen, RAI, xFinity, Channel4, AnimeLab, US Open, Spotify, Vudu, Beats Music, YuppTV, Tidal, Warner Bros. Television, NPO, WatchAFL, Viki, PopcornFlix, Disney Channel, NBC, ZDF, BBC Radio, Starz, Bloomberg TV, TV Land, Investigation Discovery GO, Telecinco, Wilmaa, FranceTV Sport, BT Sports, Molotov TV, MSG GO, Teleboy, UKTV Play, The Loop, EuroSports Player France, Tentkotta, Animax Plus, Arte TV OnDemand, CBS, MLB, MHz CHOICE, SONY LIV, TNT Dallas, Spike, Oxygen, Channel 5 Demand5, FOX Sports, Wuaki TV, TVNZ, Radio.com, Gulli Repay, Atres Player, Alleskino, Horizon GO, Showtime Anytime, Willow TV, TVA Nouvelles, sport1, Watchever, Turkcell TV, Bet, YouSee, MAX GO, FOX NOW, Sony Music Unlimited, Sky Go Germany, STV Flow, CUATRO, Showtime, Funimation NOW, Einthusan & Asian Crush — and the list just goes on and on! This was a guide on, how to circumvent geographical restrictions. Is there a specific site, or channel that you want to unblock? Is geolocation circumvention working? Comments, questions below! And as usual, I’d like to share a little notice that some of the bits of content on my site may contain monetary beneficial affiliate links. This support is voluntary, but I am most grateful if you don’t clear your cookies. Greatest thanks! David.